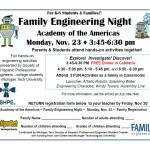 The Michigan Tech Student Chapter of the Society of Hispanic Professional Engineers (SHPE) will be at Academy of the Americas on Monday, November 23, spreading the word about engineering and STEM career pathways during a “Family Engineering Night.” A free dinner for families will be provided 3:45-4:30 p.m. in the school cafeteria. 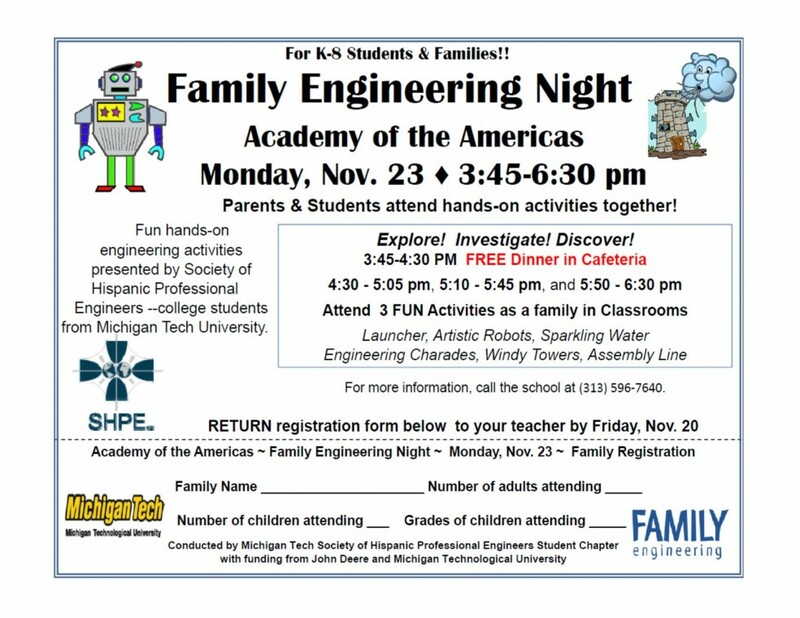 Families will attend three 35-minute fun hands-on engineering activities from 4:30-6:30 p.m. Theevent is made possible with a grant from John Deere to the Michigan Technological University Center for Science and Environmental Outreach. Michigan Tech is a co-developer of the Family Engineering program, along with the Foundation for Family Science and Engineering and the American Society for Engineering Education. To learn more, visit: http://www.familyengineering.org/ or contact co-author Joan Chadde, Director, Michigan Tech Center for Science and Environmental Outreach, at 313-487-3341 or jchadde@mtu.edu.